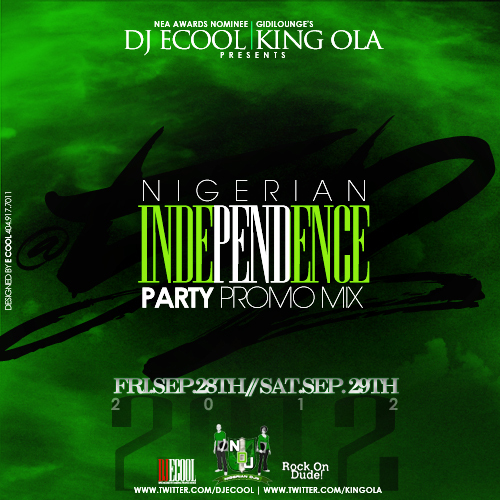 DJ ECOOL & KING OLA present the Official Promo mix for the Nigerian Independence Day Celebration in Atlanta, GA! 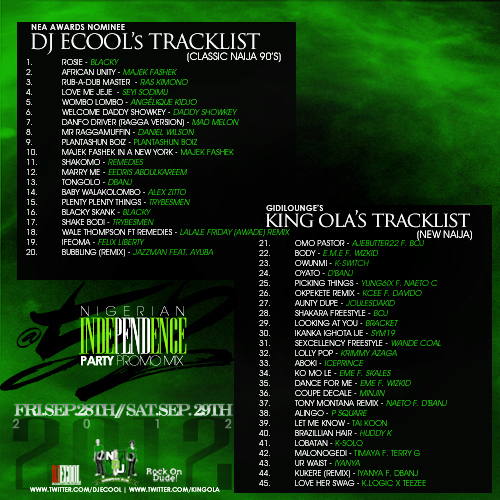 Nigeria turns 52 this year and just like they did last year, DJ ECOOL & KING OLA are back with the Nigerian Independence Day Party Promo Mix. Last year’s classic tape had to be followed by something more suitable which is why this year’s tape features NAIJA Classic tracks from the past such as ROSIE by BLACKY, LOVE ME JEJE by SEYI SODIMU, RUB-A-DUB MASTER by RASKIMONO and recent hit tracks @ 52.
really? ..can you try it again?. Your talented, keep up the good work. Good Job to King Ola as well.